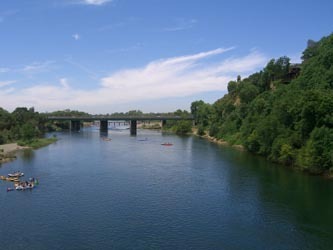 The lower section of the American River flows from Folsom Dam to its confluence with the Sacramento River at the delta. Easy access and very gentle flows make it an extremely popular float trip. The bulk of this section of river is class I, but there are a couple class II rapids that are fun for play-boaters (San Juan Rapid is your best bet). Despite its popularity and gentle flows, common sense and life jackets are non-negotiable as deep currents, hidden debris, and other hazards are always present. This is especially true after a flood or during unpredictable winter weather. Caution should always be exercised in the hot summer months as well. The San Juan Rapids are really the only whitewater on the Lower American River. San Juan Hole is popular year-round with kayakers looking to show off their playboating skills.